DECEMBER 3--Meet April Westfall (and her green Subaru wagon). The Nevada woman was arrested early yesterday on a drunk driving rap. And while there's nothing special about a 4:30 AM DUI bust, the circumstances of Westfall's arrest are unique. First, she was pulled over by an ambulance crew, not police, on U.S. Highway 395. 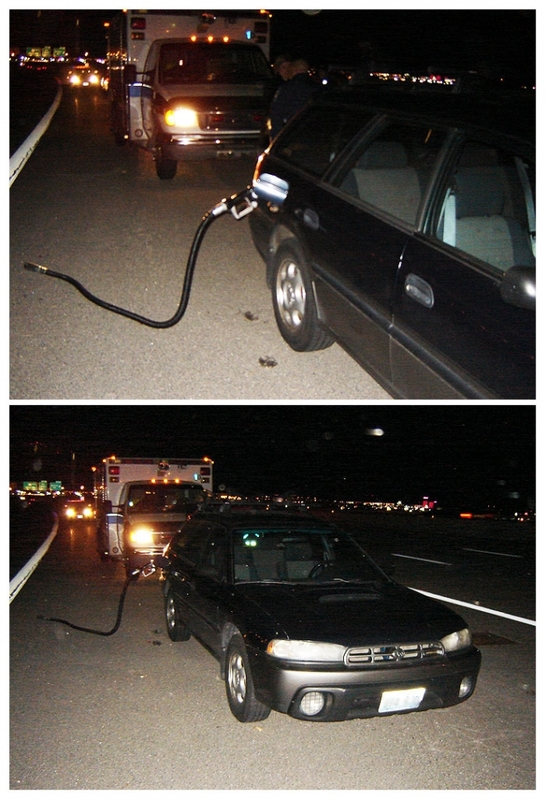 And, as seen in Nevada Highway Patrol photos, crew members were alerted to Westfall's ride when they noticed a fuel nozzle (and six feet of hose) attached to her gas tank. Westfall, a 40-year-old Reno resident, subsequently failed field sobriety tests and was booked into the Washoe County jail, where the above mug shot was snapped.